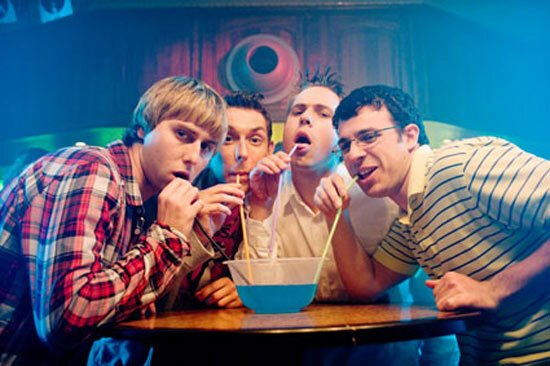 The Inbetweeners is easily one of my favourite television comedies, capturing the awkward vibe of teenage life and blending it superbly with a hilarious wit. So although I'm inevitably saddened by the third series drawing the show to a closure, the big screen adaptation is here to give our hysterical quartet a satisfying write off, and believe me, you fans certainly won't feel short changed. Having left sixth form, the lads Jay (James Buckley), Simon (Joe Thomas), Neil (Blake Harrison) and Will (Simon Bird) depart for a two week clunge-tastic holiday in Malia, Crete. But things don't go according to plan as the chances of them getting laid by four generous girls they repeatedly encounter begin to deteriorate, causing them to turn on each other unsurprisingly and stir up pure madness in the process. The Inbetweeners Movie truly is a delight for those who adore the television series; yes, in some parts the gags are of extremely bad taste, and it doesn't possess the same level of wit as it's small screen counterpart, but there's going to be a plethora of moments where fans will feel right at home. The characters are their usual, socially inept selves, causing pure teenage mayhem wherever they set foot and managing to turn a basic conversation into a dramatic and equally comedic nightmare. Though the age certificate may suggest otherwise, it's a tad more crude than the show in some respects (you will see for yourself), and it never feels watered down to simply attract a wider audience. In terms of story, there isn't much depth to this movie. It's essentially just a series of funny events that set up the next. The backbone of the story is certainly here to keep the events sewn together nicely, but it's ultimately the characters and their idiocy that's being focused on, which works just fine. There's a few pacing problems here and there, and some forced emotional scenes (though in all honesty I doubt any of them were intended to be taken seriously) but these don't detract from the solid sense of humour the movie possesses. Though truly a satisfying conclusion for these great, eccentric characters, there's a distinct (albeit not unexpected) lack of emotion to the script, so if you were expecting stuff like that, it's not here I'm afraid. The acting is where the jokes are truly brought to life in a flawless manner; our main quartet steal the show easily with their awkward, snide and downright silly performances, triggering most of the laughs throughout these 95 minutes. The other series favourites like gargantuan dickhead Mister Gilbert and Jay's insane father make small yet hilarious appearances, and the four girls who debut (Laura Haddock, Tamla Kari, Jessica Knappett, Lydia Rose Bewley), while certainly not the source of all the laughs, are a pleasure to watch all the same. A hilarious if imperfect experience from start to finish, The Inbetweeners Movie succeeds in creating a big screen adventure that almost matches the brilliance of the television series (yes, almost) and will certainly please all long time fans, including you 12 year olds who will undoubtedly sneak into the cinema. Those uninterested certainly won't be won over, but this is utterly essential for those who adore the previous misadventures of the four beloved lads.